APRIL 30, 1975. 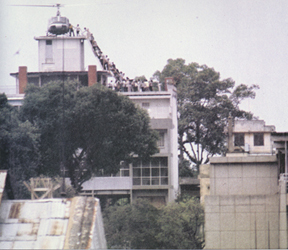 As the South Vietnamese army collapsed and the North surrounded Saigon, U.S. forces helped evacuate many civilians who had collaborated with the U.S.-backed effort. 30 years later, many wounds of this conflict have healed, but let the scars continue to speak to us. What did we learn? How have we changed? For what shall we live? How do we approach conflict? How shall it best be resolved?